There have been so many imports from other cities this past year (Pok Pok, Toro, Mission Chinese and so on) so why not add another to the list? Joining the list is a Szechuan style restaurant in East Village called Han Dynasty that opened a few months ago. We stuck with some basic Szechuan dishes. 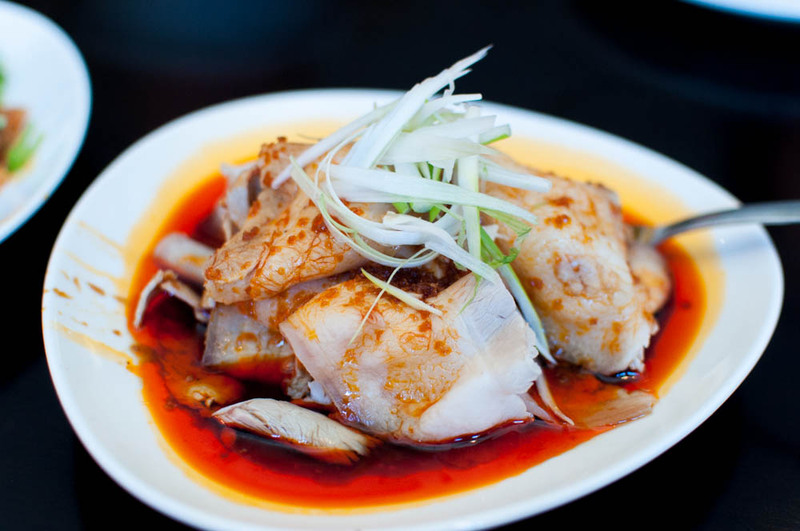 After all, that is probably the best way to compare against other Szechuan restaurants in the city. For starters, we sampled the beef and tripe in chili oil. This is probably my favorite rendition of the dish in the city. 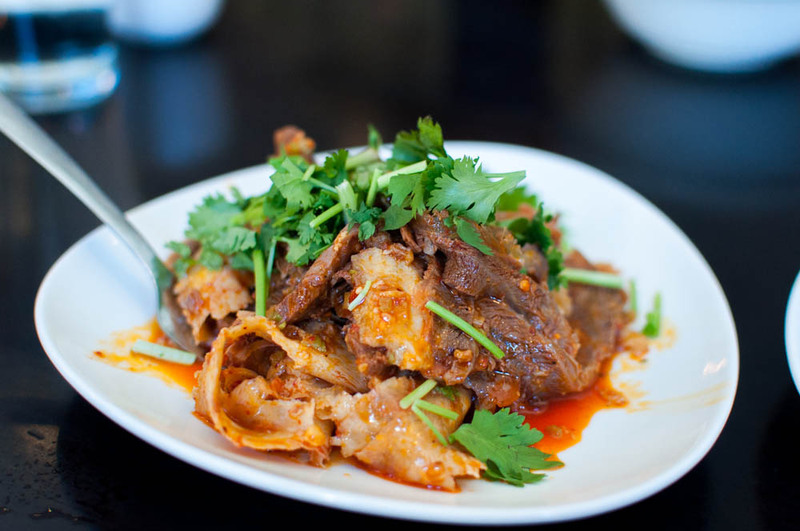 The thinly sliced pieces of beef and tripe dressed in a numbingly spicy dressing might not be for everyone but this is a pretty much standard at any good Szechuan restaurant. I loved how the spiciness of the dressing didn’t overwhelm other flavors, so you can still taste the vinegar and the beef. We followed up the beef and tripe with a plate of pork belly in garlic sauce. The pork belly was sliced very thinly and the garlicky soy based sauce brought the relatively mild pork belly a punch of flavor. By the look of it, you would think that the dressing in both dishes are the same but the dressing here was much sweeter versus a vinegar bite. Dumplings in hot oil is also another good barometer. 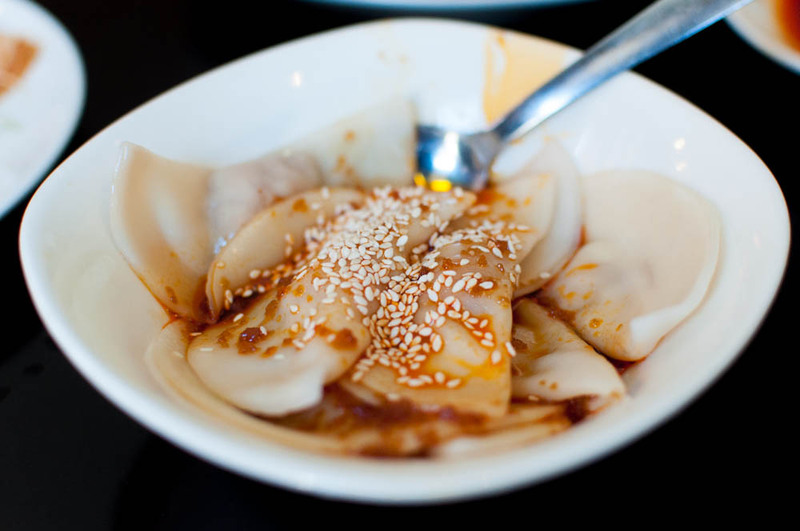 The dumplings here aren’t super plump but the pork was flavorful and the skin had a nice chew. Not a bad starter. 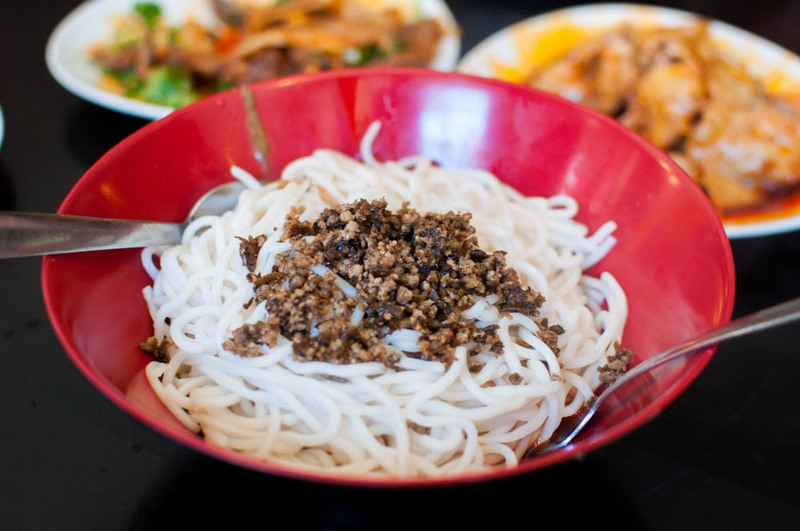 And of course, we can’t forget dan dan noodles. This is essentially the Szechuan version of a bolognese made with pork ragu and a spicy sauce, meant to be tossed to combine table side. Han Dynasty’s take on dan dan noodles uses a peanut dressing instead of the traditional dressing and was a little stingy on the pork. This might not have been the most authentic or my favorite dan dan noodles but there is something to be said about the portion of the noodles here. One order was practically the size of an entree. Most of the entrees at Han Dynasty is organized into an almost dizzying 14 different cooking styles, allowing you to select the protein. For me, no meal at a Szechuan restaurant is complete without a spicy fish stew, or in the case here, found under the hot sauce style. The dish arrived in a thin ceramic bowl, brimming with a thick sauce and a generous dusting of dried chili powder on top. The fish was tender and the napa cabbage underneath well flavored, the version at Han Dynasty was less oily than at some other restaurants with just the right level of spiciness. We supplemented the fish with a plate of lamb in cumin style. 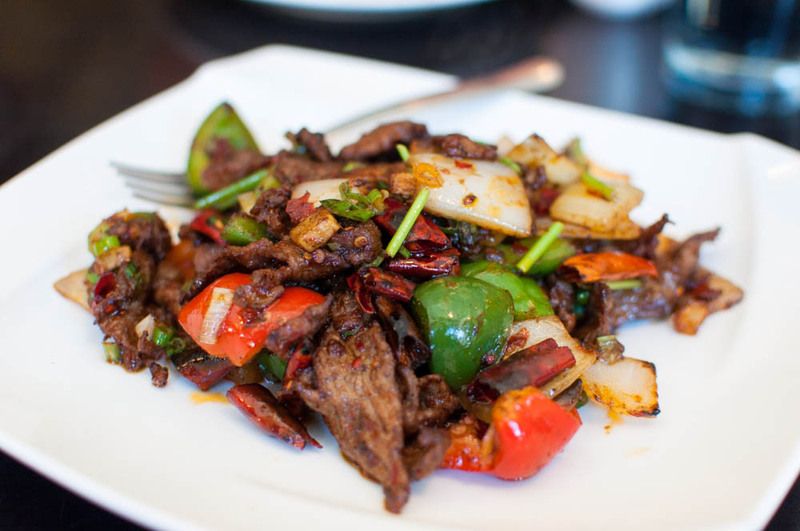 The thin lamb slices were dusted in a cumin powder and quickly flash fried and sauteed with a variety of vegetables. The dish was lighter than I have had elsewhere and the addition of vegetables added a nice textural touch to round out the dish. 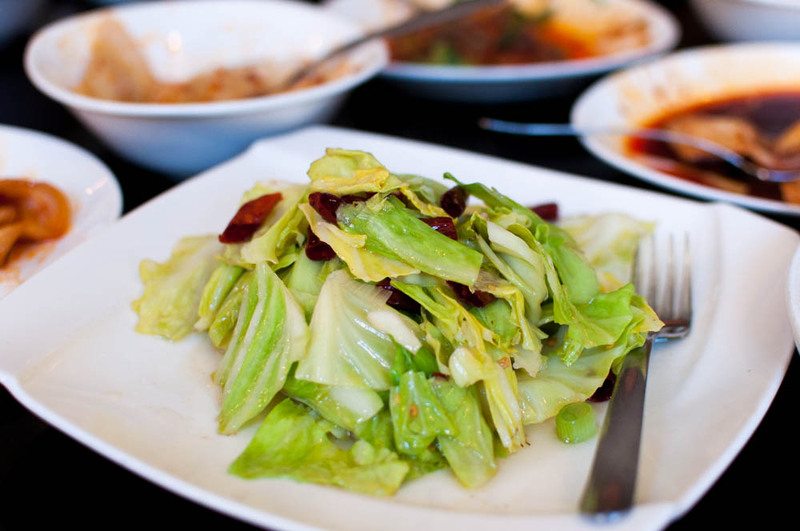 Instead of the typical string beans with minced pork or mapo tofu, we chose a plate of sauteed Chinese cabbage with chili peppers. Dressed simply, the plate of vegetables was a nice reprieve from the otherwise spicy and numbing meal. 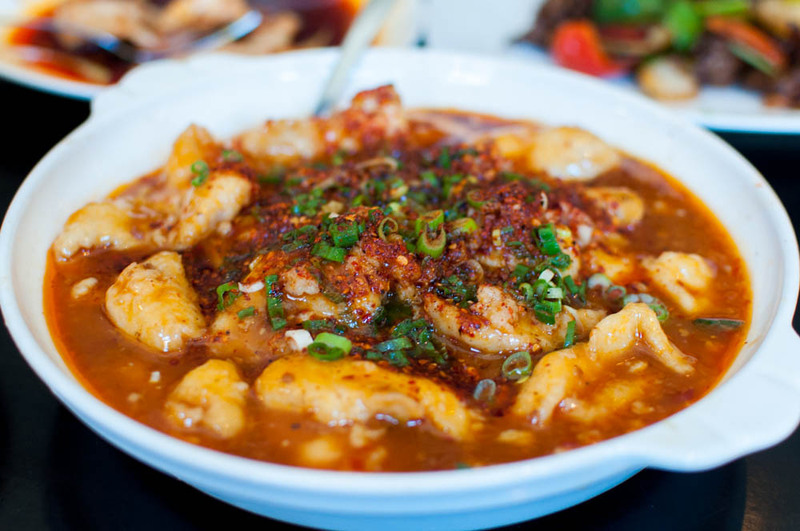 Overall, Han Dynasty did a great job capturing the spirit of the Szechuan cuisine in a comfortable environment. Not too heavy handed on the oil or peppers, many dishes struck a nice balance in what seems to be a battle of spiciness. 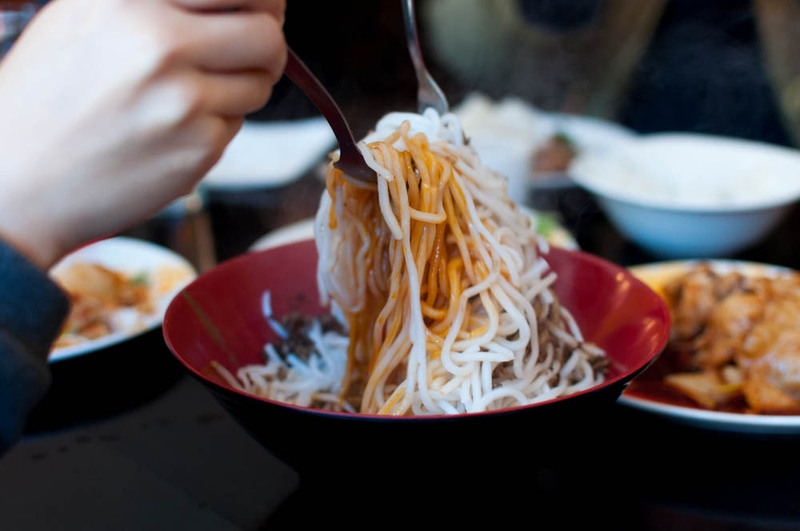 That combined with quality ingredients makes Han Dynasty a formidable contender in the title for best Szechuan restaurant in New York.